News Flash: Origami man-purse breakthroughs revealed! we suspect it might actually represent some mysterious breakthrough in man-purse technology. But did you believe us? Yesterday, of course, Microsoft finally pulled off the already slowly dissolving wraps on its new book-size computer format with a decidedly snoozy name: the Ultra-Mobile PC. And while the Ultra-Mobile PC comes chock-full of interesting technology, and will likely enable many previously unimagined uses, we stick to our guns: the biggest innovations resulting from the Origami Project will be in the development of man-purse technology. Supporting evidence for our contention comes rather quickly: A company named Eleksen, which has been working with Microsoft, has revealed plans to integrate their ElekTex “smart fabric” into five separate high-technology man purses. 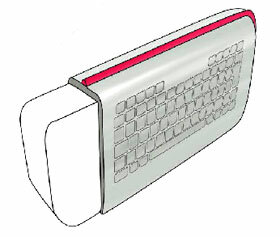 ElekTex is the technology behind Eleksen’s newly introduced fabric USB keyboard, as well as fabric iPod controller-cases, Bluetooth devices, and electronic sleeve buttons. Eleksen describes five styles of these innovative man purses, conceived especially for the Ultra-Mobile PC: the Clam, the Courier, the Folio, the Slip, and the Station. The Clam is a neoprene case for the Ultra-Mobile PC, with a fabric keyboard integrated into the bottom of the case, which you can access once you open it. Audio controls, which control Windows Media Player running on the UMPC, are accessible on the outside. The Courier is a messenger bag that has media-player controls mounted onto the strap. The UMPC is lodged into a compartment of the bag where it attaches to the bag’s USB connector. The Folio is a soft bookcover with an integrated leather keyboard and scroll bar. It lies flat on a table once opened. USB connectors and printed circuit boards are built into the folio spine. 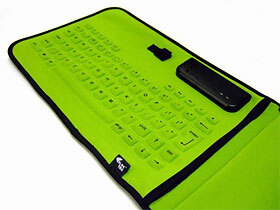 The Slip is a simple protective sleeve for the UMPC, featuring a keyboard and hotkeys built onto one side. We must admit we were a little stumped by this man purse, because it seemed at first to be intended primarily for those times when you need access to a keyboard but don’t need to see the screen. But then we realized that you’re probably supposed to take the UMPC out of the slipcase before you start typing. Doh! We are most intrigued, though, by the Station, which, like the Folio, wraps around the UMPC to create a small, easily carried clutch. Media controls are on the outside of the clutch. 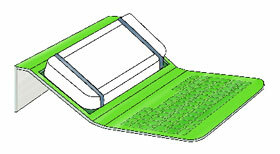 The UMPC is held in place by a couple of straps, and the back flap of the unfurled Station folds down to elevate the screen to an appropriate viewing angle. Frankly, we’re far more excited about Eleksen’s innovative man-purse concepts than we are about the Ultra-Mobile PC in general. (We liked it better when everyone called it the Origami, anyway.) Smart fabrics like ElekTex will make us enthusiastic about carrying anything, really. How often do we get to push buttons to control our clothing or accessories? 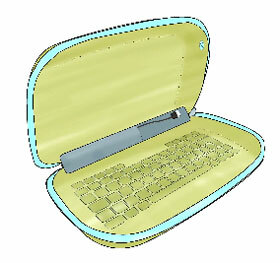 If we have to slip a UMPC inside to make the whole ensemble work — well, we guess we’ll have to do it. This entry was posted on Friday, March 10th, 2006 at 1:53 pm	and is filed under Clutches, Electronics, Gadget Bags, Handheld Bags, Laptop Bags, Man Purse Technology, Messenger Bags. You can follow any responses to this entry through the RSS 2.0 feed. You can leave a response, or trackback from your own site. Advueu bought the rights to the TDVVisions (that’s double V there) tabletPCs and the link about shows the tabletpcs with the station kinda of carrier bag + keyboard combo. They also have another carrier bag without the keyboard for slate-only usage. Keyboard goes via USB (I think).